We all know that food is medicine, but when it comes to drastically reducing your colon cancer risk, it could not be truer. Simply making a few dietary tweaks can slash your colon cancer risk. Here are the 12 proven ways to do so. Processed luncheon meats, bacon, cold cuts, hot dogs, sausage and other types of processed meats have been classified by the World Health as “Group 1” carcinogens, in the same category as cigarette smoking and asbestos. In addition to high amounts of saturated fats, processed meats typically contain nitrites and nitrates that are known carcinogens and are best avoided. Curcumin, one of the phytonutrients found in the spice turmeric, has been found in numerous studies to reduce colon cancer risk. A study found in Cancer Prevention Research showed that curcumin suppresses the ability of colon cancer cells to proliferate, suggesting it is helpful both in the prevention and treatment of the condition. The connection between a poor diet and colon cancer has been well-established for many years, but the mechanism by which a poor diet increases the risk has been largely unclear. According to research from the Cleveland Clinic, a high fat diet drives the growth of cancer stem cells. Cut back on fast foods, processed foods, prepared foods, meat, butter, and other fatty foods. While we’ve already established that processed meats, and fats from meats are factors, research also shows that diets high in animal protein are also linked to colorectal cancer. This is especially true of red meat, which has also been linked to colorectal cancer in research published in the Journal of Gastroenterology. Additional Canadian research published in the Nutrition Journal found a “meat diet pattern” increased the risk of colorectal cancer. The Nutrition Journal study also found a correlation between a diet that contains sugary foods and colorectal cancer. Choose fruit over refined sweets. Research published in BMC Complementary and Alternative Medicine, found that resveratrol found in purple and red grapes may actually suppress colon cancer stem cells, suggesting a possible prevention and treatment strategy. Cancer stem cells perpetuate the creation of new cancer cells and tumors. 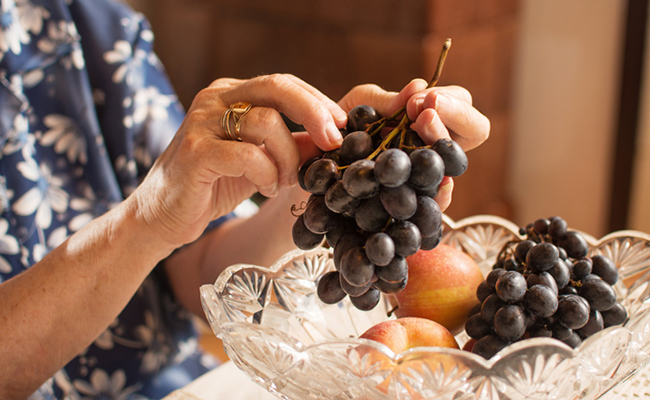 Resveratrol found in grapes not only suppressed cancer stem cells, it also reduced the number of cancer tumors by 50%. Simply adding one ounce of walnuts to your daily diet significantly cuts your colon cancer risk. The researchers hypothesize that walnuts act like probiotics in the intestines to ensure a healthy gut, which in turn protects against cancer. Research published in the Journal of Proteome Research found that nutmeg (Myristica fragrans), reduces the precursors of colon cancer. The Journal of Proteome Research found a little-known connection between the toxins secreted by harmful gut microbes and colon cancer, suggesting a possible link between gastrointestinal (GI) tract infections and colon cancer. Eating more fermented foods like kimchi, sauerkraut, dairy-free yogurt, can help keep harmful gut microbes at bay. While many experts suggest that we aim for 35 grams of fiber daily, research shows we should aim higher than that. Researchers found that even switching to a high fiber, low fat diet for 2 weeks, significantly reduces colon cancer risk. Cell multiplication drastically drops while the formation of cancer-killing compounds significantly increases, making the colon less vulnerable to cancer. In a study, researchers found that women who obtain at least 800 mg of calcium daily had a 25% lower colorectal cancer risk than those who had 400 mg daily. Dairy products are not recommended as they have been shown to rapidly change microbes present in the gut in favor of inflammation-causing ones. The best calcium-rich foods to include are: carrots and carrot juice, kale and other dark leafy greens, sesame seeds and tahini, almond butter and almonds, broccoli, oats, and navy beans. Green tea contains a variety of potent anti-cancer nutrients known as polyphenols, including the most notable one epigallocatechin gallate (EGCG) which has been proven effective against cancer in many studies. ​EGCG is highly anti-cancerous and can prevent tumors from forming in the colon. Drink at least 3 cups daily to maximize protective effects. What’s in that Starbucks Eggnog Latte? Thanks for sharing this information.The colon cleanse is used to improve the bodyâs natural detoxification processes, restore digestive health and improve someoneâs overall quality of life.Supplements play a very important role in cleansing your colon. Bowtrol colon cleanse ingredients are very good for gut health.